BSE Sensex closed higher by 292.76 points, or 0.84%, to 35,208.14, while NSE’s Nifty 50 rose 97.25 points, or 0.92%, to close at 10,715.50. 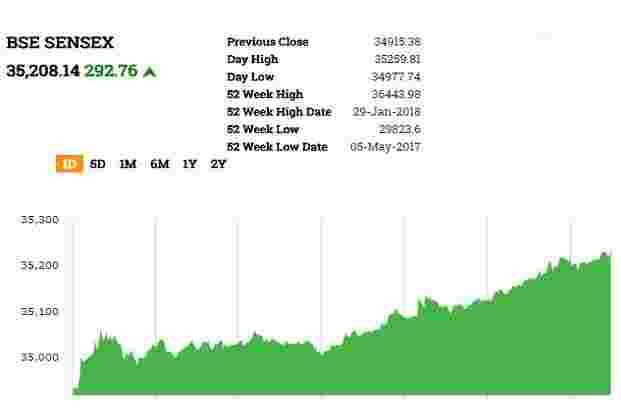 All the sectoral indices on BSE, except healthcare and IT, ended higher, with consumer durables, metal, oil and gas, realty, bankex, capital goods and auto leading the gains by rising over 1%. BSE MidCap and SmallCap gained 0.55% and 0.56%, respectively. M&M, ICICI Bank, Axis Bank and Tata Steel were top gainers, whereas Coal India, Dr. Reddy’s Labs, TCS and Sun Pharma were among the major losers. BSE Sensex traded higher by 288.41 points, or 0.83%, to 35,203.79, while the Nifty 50 rose 94.15 points, or 0.89%, to 10,712.40. Exide Industries Ltd shares jumped 4.47% to Rs259.70 after the company reported a net profit of Rs190 crore in the March 2018 quarter, up 15.8% from Rs164 crore last year. March-quarter revenue from operations stood at Rs2,459 crore versus Rs2,204 crore a year ago. Ahmedabad-based Infibeam Incorporation Ltd on Monday said it will acquire Snapdeal’s subsidiary Unicommerce, which offers e-commerce enablement software, in a deal worth up to Rs120 crore. “Under the agreement, Infibeam will issue optionally convertible debentures on preferential basis to Jasper Infotech valued up to Rs120 crore, subject to shareholders’ approval,” Infibeam said in a statement. The Indian rupee on Monday weakened past 67-mark to hit a 15-month low against US dollar after foreign investors continued to liquidate its holdings in local equity and debt market. The rupee was trading at 67.12 against US dollar, down 0.37% from its previous close of 66.87. The currency opened at 66.82 and touched a low of 67.17—a level last seen on 8 February 2017. Year to date, it lost over 4.5%.Meanwhile, the government 10-year bond yield tumbled nearly 13 basis points, declining for the fourth straight session, after the Reserve Bank of India (RBI) announced open market operations (OMO) next week. The 10-year bond yield stood at 7.637%, down 9 basis points, from its previous close of 7.728%. Bond yields and prices move in opposite directions. BSE Sensex traded higher by 206.36 points, or 0.59%, to 35,121.74, while the Nifty 50 rose 67.85 points, or 0.64%, to 10,686.10. Vijaya Bank shares gain 1.59% to Rs60.80 after the company reported a 1.6% increase in its March-quarter net profit at Rs207.31 crore, compared to a net profit of Rs203.99 crore in the same quarter a year ago. Suven Life Sciences Ltd shares jumped 3.56% to Rs187.70 after the company said said that USFDA has issued an establishment inspection report following conclusion of an inspection at their facility in Pashamylaram near Hyderabad. USFDA concluded that the facility is considered to be in an acceptable state of compliance and has determined that the inspection classification of this facility is “no action indicated”. BSE Sensex traded higher by 176.64 points, or 0.51%, to 35,092.02, while the Nifty 50 rose 51.75 points, or 0.49%, to 10,670. All the sectoral indices on BSE, except healthcare and IT, traded higher led by metal, consumer durables, realty and basic industries by rising over 1%. BSE MidCap and SmallCap gained 0.31% and 0.53%. Shares of Aurobindo Pharma Ltd rose 1% to Rs618.55. Aurobindo Pharma Ltd has submitted an initial bid to buy Novartis AG’s dermatology generics drug business for about $1.6 billion, reported Mint, citing two people directly aware of the development said on condition of anonymity. Reliance Infrastructure Ltd shares rose 1.11% to Rs426.75 after the company said it and Astaldi S.p.A (Italy) in joint venture have bagged a Rs6,994 crore EPC contract for the Versova-Bandra Sea Link Project in Mumbai. BSE Sensex traded higher by 135.03 points, or 0.39%, to 35,050.41, while the Nifty 50 rose 39.05 points, or 0.37%, to 10,657.30. PC Jewellers Ltd shares gained 17% to Rs204 ahead of its board meeting on 10 May where the board will consider buyback of shares. ICICI Bank shares rose 0.6% to Rs284.65 ahead of its March quarter earnings. According to 18 Bloomberg analyst estimates, the bank may report a net profit of Rs1,060.80 crore. BSE Sensex traded higher by 125.45 points, or 0.36%, to 35,040.83, while the Nifty 50 rose 28.65 points, or 0.27%, to 10,646.90. The government 10-year bond yield on Friday tumbled nearly 13 basis points after Reserve Bank of India (RBI) announced open market operations (OMO) next week. This was the fourth consecutive sessions when the bond yield fell. At 9.15am, yields on 10-year government bond stood at 7.609%, down 12.90 basis points, from its previous close of 7.728%. Bond yields and prices move in opposite directions.RBI will buy government bonds worth up to Rs10,000 crore on 17 May. The purchase of securities will be made under the central bank’s open market operations (OMOs), RBI said on Friday. The decision is based on the “assessment of prevailing liquidity conditions and also of the durable liquidity needs going forward”.